Low Humidity can be a big issue during the winter months. People may be familiar with the effects of dry air discomforts associated with cold winter weather like itchy dry skin or scratchy throats, not only does it affect health but it affects some of your household items. From antique furniture and photo albums to pianos and even wine, low humidity levels can wreak havoc on many of our prized possessions. The designers of Honeywell and indoor air scientists have released new research on how everyday household objects suffer under low humidity conditions and what steps homeowners can take to combat the effects of dry air. Wood Furniture: Has your favorite wooden bench seemed a little shakier? It could be because of low humidity. Wood absorbs and desorbs water as relative humidity rises and falls, which causes it to swell and shrink. This results in furniture joints becoming loose or even pulling apart. Musical Instruments: Not sounding quite right? Low humidity levels may be to blame for your instrument falling out of tune. Natural wood instruments such as guitars, violins and pianos can be damaged when the wood contracts resulting in failed glue joints or cracks. Books: Low humidity causes the pages of books to become more brittle and fragile, and the dimensions of the pages can even change as the paper absorbs and desorbs water. This leads to wrinkles in the paper, flaking ink, or warped covers on books. Woodwork and Wood Floors: If you’ve noticed a slight bend in your wood floors, or gaps between the planks, it could be because of low humidity. As the wood expands and contracts, mitered corners can separate and floors can “cup” so that the floor doesn’t remain flat. Wine: Does your uncorked bottle of wine not taste right? Wine corks can dry out, shrink and crack if exposed to low humidity overtime, allowing air to come into contact with the wine and potentially ruin the bottle. Artwork: Maintaining humidity levels is vital for protecting artwork around the home. Low moisture levels tend to make paint brittle and prone to cracking, which is especially detrimental to oil paintings on canvas. Stamp Collections: Much like books, repeated absorption and desorption of water can ruin stamps by making them brittle or discolored. Photograph Collections: Have you noticed your new photographs looking more like your parents’ photo albums? When photographs curl up at the ends, it’s likely due to low humidity levels. They can also result in the photo emulsion flaking off and damaging the photograph. Walls: Peeling wallpaper and separated drywall seams can be a sign of low humidity in the home. The porous materials may crack and separate when exposed to low levels. Electronic Equipment: Static electricity brought on by low humidity levels can damage internal components of computers, televisions and other electronics – a lot more damaging than dealing with static in your hair! Running a Honeywell Humidifier in your home, especially during the dry winter months, can help maintain relative indoor humidity levels in the optimal 40 to 60 percent range. Designed for large areas, the new Honeywell Top Fill Console Humidifier is one option for protecting items around the home as it releases soothing, invisible moisture into the room. Head over here to check out what Conservamom thought of her humidifier! One lucky winner will have the chance to own this fantastic humidifier that retails for $109.00. So head below for your chance to win! Giveaway open to US residents only and ends on 3/7 at 11:59pm EST! Good luck! I need humidity just to breathe and sleep good. The lack of humidity affects my health – it gives me a sore throat, dry mouth while sleeping, congestion and dry skin. Lack of humidity makes me have dry skin. Not a whole lot of humidity in the desert. Our skin gets really dry and wood furniture needs to be oiled to stay nice. Our noses and skin in general get so dry and crusty or flaky. What is one thing that the lack of humidity affects in your life? The most noticeable effect is on my own body – terribly dry skin and nosebleeds. I can’t keep the humidity high enough to be comfortable, and I can’t light candles because they zap even more of it. 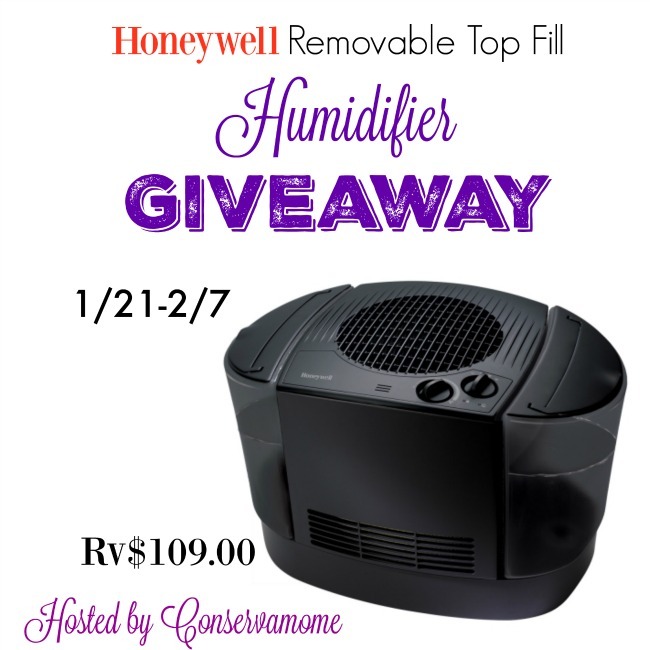 Thanks for the opportunity at a chance to win a new humidifier.